Val. Zlotopolets (1891 (?) – ?) – unknown Ukrainian writer, author of the historical novel "Son of Ukraine" (1919). Biographical information about him is very limited. It was presented by I. Fediv in afterword to reprint the story (Munich: 1946) and A. Pavlyshyn in the same afterword to reprint in Lviv in 1992. Full name of the writer is unknown (Valery? Valentin?). Internet does not know surname "Zlotopolets" (except the author of this story), so one should guess what it is – a nickname derived from the name of the town Zlatopil (now part of Novomyrhorod in Kirovograd region). The year of his birth – and approximately 1891, the birthplace is considered the Dnieper region. It is known that he studied in some Kiev school, and in 1919 collaborated with the publishing house "Vernyhora." A little more is known of his collaborator – (1895 – 1962). 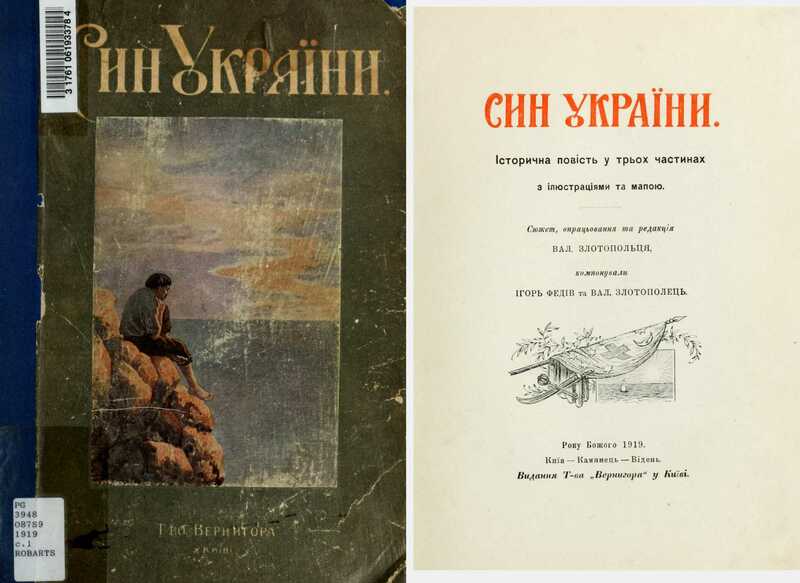 Cover and title page of story "Son of Ukraine" (1919). The historical novel "Son of Ukraine" had been published a very elegant, even luxurious, in a solid color cover (a scan of this publication ). Some pages are printed in two colors, each chapter provides specially drawed headband, often – as the ending. In addition to these bar prints on separate sheets pasted monochrome and color illustrations. Author of illustrations unknown, only the ending to chapter 3.9 in the lower left corner is signed «Paulus» (draftsman? engraver?). In our e-reissue we tried to reproduce this illustrative material. Some sections of the story, as pointed out by the authors, is taken from the book of Joachim Heinrich Kampe (1746 – 1818) «Robinson der Jüngere», which, in turn, is remaking the book of Daniel Defoe. M. Zh., June 18, 2014.